Havana (AFP) - A poster of US President Barack Obama popped up in central Havana Thursday in a revolutionary change to the portraits of Che Guevara and other communist leaders plastered around Cuba. Cubans are used to living under the gaze of billboards, paintings and other depictions of Fidel Castro and his comrades in arms Che and Camilo Cienfuegos, as well as 19th-century independence leader Jose Marti. But three days before Obama arrives in Havana for the first visit of a serving US president in nine decades, a restaurant entrepreneur has broken the bearded revolutionaries' monopoly. 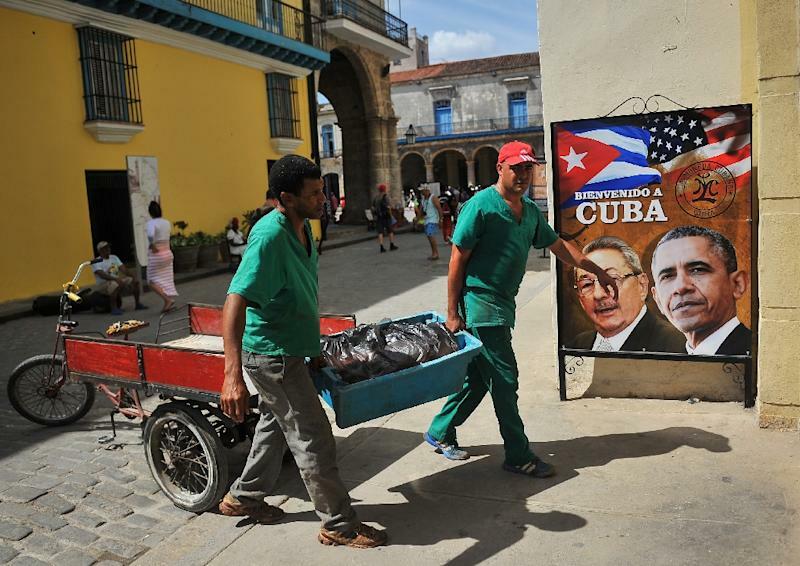 The poster, put up in the street near a cathedral that Obama is expected to visit after his arrival Sunday, is a montage showing Obama alongside Raul Castro, the Cuban president and brother of Fidel. "Welcome to Cuba," the poster says under the Stars and Stripes and the Cuban flag. Miguel Angel Morales, owner of La Moneda Cubana restaurant, said putting up the poster was a big step in a country where the United States has been long been the enemy and where political imagery is tightly controlled. "As far as I know there's never been a portrait of a North American president before," Morales, 41, told AFP. "In our restaurant we've had the US flag up inside for five years, but this is also the first time we've shown it outside," he added. Morales said he hoped the authorities would not tell him to remove the picture. "We'll see what happens," he said. "The more publicity the better for me, because it will be harder for them to do anything against us." Sergio Fundora, a worker on one of the many building restorations in Havana's rundown historic center, said the poster didn't shock him. "It doesn't worry me," Fundora said. "These changes should have happened a long time ago."